Cost to paint a stairway varies greatly by region (and even by zip code). Get free estimates from painters in your city. Cost to paint a stairway varies greatly by region (and even by zip code). The average cost of painting a stairway is $350 - $450. How much does it cost to paint a stairway? Painting a stairway refreshes a room with a new look. It can turn boring stairs into a focal point in any decor and create a more personalized space. Stairways may seem simple and even basic, however, in reality, they are complex with numerous risers and treads. The intricate angles of a stairway benefit from having a professional painter handle the project to ensure it looks ideal when complete. The multi-angled nature of a stairway design and build can quickly create mounting costs when painting the structure. An average 12’ high, straight stairway will usually cost from $350-$450 to have it painted by a professional painter. Many parts of a stairway can be painted and must be factored in when determining the final cost. Walls, treads, risers, posts, balusters, ceiling, spindles, and handrails may or may not be present on the stairway. Each item can be painted separately at a future date or factored in as one complete job. Generally, a painter will do the entire paint job at one time to make the stairway look its best when finished. Remember that most painters charge by the hour, so the more things that require painting the longer the painter will need to complete the job. It is advised that a professional painter determine the size of the job and figure in all aspects such as the walls, treads, risers, posts, balusters, spindles, handrails, and ceilings that may or may not need to be painted to give an estimate of the job’s cost. Painters charge around $50 per hour. In order to properly estimate the cost of painting a stairway, the surface size must be calculated. The length of the stairway treads and risers need to be measured to determine the surface area. This is achieved by multiplying the length by width. To determine the tread length the tread nosing, the run, and the rise must all be added together. Then measure the width of the tread. Multiply the total of the tread length and the width together to achieve the surface area. If the stringers are being included in the paint job then add an additional 2’ to the tread width before multiplying. The stairway hand railing is measured by starting at the top of the landing and measuring to the floor and then adding 2’ to determine the linear length of the hand rail. A professional painter usually includes the cost of prep work materials in his job cost estimate. However, a homeowner can discuss providing the prep work materials for the painter to receive a possible discount. Whether staining or painting, the surface of most stairways will require sanding prep work to remove old paint or soften the surface of any blemishes. Sandpaper averages $4-$11 per pack for general purpose sandpaper. Painting can be messy work. 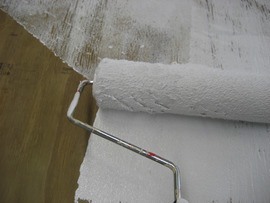 The area must be prepared prior to priming and painting all surfaces. The edges of the stairs, walls, and other surfaces will need to be lined with painter’s tape to prevent smudges. The cost of painter’s tape generally runs from $5-$7 per 60 yards. Nail holes or blemishes may need to be repaired with spackle. A quart of spackle costs $5-$10. Lightly sand the spackle after it dries to create a smooth surface. The entire area will need to be dusted and vacuumed to remove any cobwebs or dirt particles prior to painting. Prior to painting, a surface must have a coat of primer applied. A primer helps ensure superior paint coverage and durability. Primer types tend to fall into three categories. There are oil-based, shellac-based, and latex-based. One gallon will normally cover a 12 ft. stairway. Primer costs $17-$50 per gallon depending on brand and type. The process of staining stairs may or may not require a primer. If the surface of the wood is unmarked then no primer 1 is generally required. However, if there are scuff marks, discolorations, or stains that cannot be sanded out then applying an oil-based primer will prevent the imperfections from marring the stained surface of the wood. There are several types of paint finishes such as flat, semi-gloss, and high-gloss. There are also water-based and oil-based paints. An oil-based paint offers excellent adhesion and a water-based paint dries quickly. Paint typically runs from $10-$50 per gallon depending on the finish and brand. One gallon is normally sufficient to cover a 12 ft. tall stairway when used in combination with primer 1. Wood stain can be used in place of primer 1 and paint. It helps bring out the wood’s natural beauty while protecting the surface. Oil based stains tend to be less expensive than gel stain. Typically, when hiring a professional painter the cost of materials such as primer, paint, stains, tape, brushes, rollers, drop clothes, and trays are factored into the painter’s estimate and account for approximately 15 percent of the price charged by the painter. A professional painter will generally complete the job from start to finish by doing all the necessary prep work such as taping and sanding. The painter will then paint and clean up when complete. Professional painters typically charge around $50 per hour and an average 12 ft. high, straight stairway would cost $365. Painting styles for a stairway are diverse. A stairway can be completely painted one shade or a variety of colors to create a color-coordinated decor. Paint generally provides a light, airy feeling. A combination of painted and stained surfaces are another option to create warmth and depth. 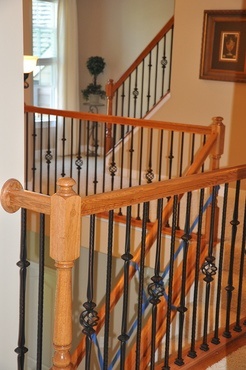 A popular painting style is to stain all components of the stairway and paint just the balusters 2. A dark stain combined with a light paint creates an elegant appearance. Staining the stairway and all parts such as the railing 3 and spindles 4 provides a warm feeling. Light paint creates a spacious ambience. 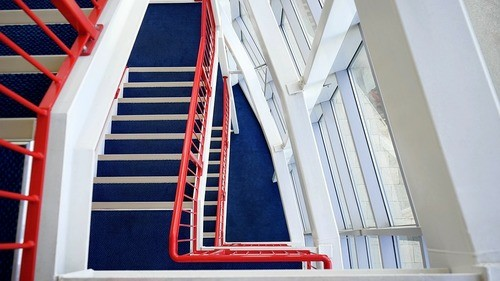 Stair repairs: prior to having the stairway painted, any carpentry repairs should be performed to make the stairway safe and structurally sound. Loose boards or broken spindles need to be repaired or replaced. The railing should be secure and not wobble. The average cost of a carpenter to repair a stairway is $45-$70 per hour. Carpet removal if existing on stairway averages $1 per sq ft. for removal and discarding. Practice ladder safety by never placing a ladder on unsure footing or in any awkward positions that may not be stable. Painting a stairway can be a DIY project, however, it tends to take much longer than having a professional undertake the job. Also, the quality is not the same. A professional painter generally offers a warranty on their workmanship that averages from 1 to 3 years. Purchasing the supplies separately and having them on hand for the painter may reduce the cost of the overall job. Re-usable rollers, brushes, and trays cost $15-$25 for a complete set. However, high-end, reusable brushes may cost up to $20 apiece. How do you paint a stairwell? Fill in any nail holes or blemishes with spackle or caulk to create a smooth surface. Prime the wall using a primer and then apply either a latex or oil-based paint with a brush or roller. What kind of paint to use on stairs? Either oil-based or water-based paint. Oil-based tends to be more durable than water-based. What is a baker's scaffold? A baker’s scaffold, also known as baker’s staging, is a rolling scaffold. It usually measures 6 ft. long by 6 ft. high and can be stacked to attain more height. How do you bui​ld a scaffold? Use a combination of lumber and plywood to build a makeshift scaffold. Build two triangles from 2”x4” and plywood to affix to the side of a wall. Run a combination of two 2”x6” boards between to the two triangles to form a platform against the wall. How much do painters charge per square foot? Painters typically charge $0.50-$1.60 per sq.ft. for an interior paint job. However, the complexity of the paint project may increase the price. How much should I pay a painter? Most painters charge $50 per hour. Intricate paint jobs may cost more. How much does it cost to paint a deck? Prices to paint a deck range from $850-$1,000 depending on the area of the country. Usually, the cost averages $2 per sq. ft.
How much does it cost to refinish wood steps? A painter typically charges between $50 per hour. The overall cost will need to be determined by figuring out the surface size of the wood steps that require refinishing. The cost of staining/refinishing wood steps averages $1.49 per sq.ft. 2 Balusters: Small pillars that are used to support a railing, such as on a staircase. How much does it cost to paint a stairway in my city? Cost to paint a stairway varies greatly by region (and even by zip code). To get free estimates from local contractors, please indicate yours. The cost guide has been remade, adding more information about the project, various options, and cost updates. The sections "Parts of a stairway," "Measurements," "Prep work," "Types of primer," "Types of stain," "Painting vs staining/refinishing," "Process and labor," and "Painting styles" have been added and there is now more detailed information about the different options, possibilities, and price ranges for this project. For example, you can find different painting styles for stairways and all the prep work needed before painting. You can also find new tables with all the types of paint, stain, primers, and their costs. Moreover, new options have been added on enhancements, such as adding a stairlift, that may not be included in the average project. The "Additional considerations" section now offers information about saving money, carpet removal, safety, and DIY tips. A "FAQ" section has been added, where you can find other information that may not be found in other sections. Cost Considerations: Wrought iron balusters and wood balusters are often similar in cost and strength. Solid iron generally costs more than hollow iron and also costs more to ship because it is heavier. Balusters can run from about $1,200 to $1,600 for a home staircase. One of a series of identical vertical supports, typically decorative, used between railing posts on decks and stairs. Cost Considerations: Spindle prices vary widely depending on the type of material used. Wood is generally the least expensive option. Wrought iron is the most expensive. The cost to clean and stain a wood deck, complete with rails and spindles (including power washing, labor, and materials) averages roughly $2 per square foot.